The Hotel Business of Rwanda. Rwanda, a small country of approximately 26,338 km2 is a hub for tourists who look forward to visiting Mountain gorillas. The biggest number of tourists who are attracted to this beautiful small country of a thousand hills and smiles are interested in the gorillas. It is one of the 3 only countries in the world with these gentle giants. The Permit goes for 1500 dollars to encounter and see the 400 pound creature for a 1500 dollar memorable experience. From what those have visited them tell, it is a once in a lifetime experience. The icing on the cake of this tour definitely is the stay, the hotels, the services offered at these hotels. With the large number of tourists visiting this country after peace and security was restored in the country, the need for great hotels for the tourists was evident. Rwanda’s hotel industry is blooming at a fast rate with several 5 star hotels coming up on the scene. For example, Kigali Serena, Marriot Hotel and Radisson Blue well situated in the capital city; Kigali, not so far away from the airport can give you the feel of a luxury hotel right after you land into the country and before you set off to your gorilla trek in Volcanoes National Park. 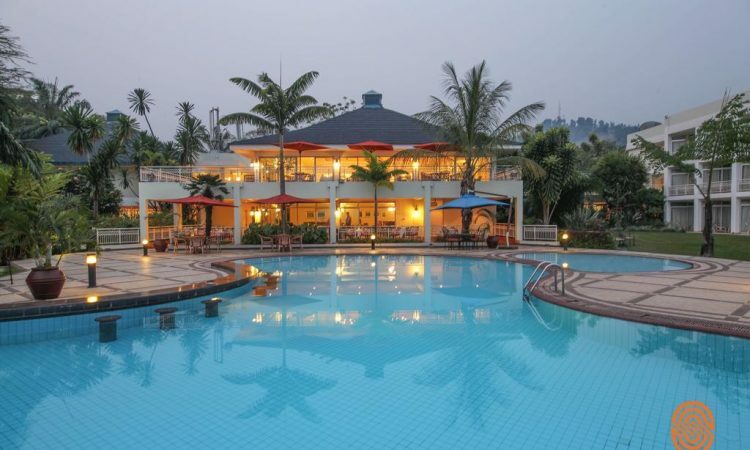 Des Milles Colline Hotel, Rwanda’s oldest hotel also, is a 4 star hotel that one would love to stay at. Out of town, next and inside the Volcanoes National Park, you find the great Bisate Lodge, 5 Volcanoes Boutique Hotel, Sabinyo Silverback. There is also Nyungwe forest lodge in Nyungwe that was ranked a 5 star too. You cannot go wrong with these hotels. However much there are great hotels in Rwanda, there are also midrange and budget accommodations for midrange and budget tourists accordingly for those on a lower budget though these ones are lacking as they are still abit pricey for the services they offer but one can survive as they are basic like Gorilla Hotel that was given a 1 star rating. These hotels have been graded according to fulfilling the standards of the class following an order regulating tourism standards of operating licenses came about in October 2016. Rwanda continuously impresses us with its hotel industry and is fighting to maintain its place on the scene with the fast growth and never ceases to amuse. Let us look forward what they have next in store. Until then, reach out to us to help you with your bookings for the suitable accommodation for your stay while in Rwanda as we have great relations with most of the hotels in Rwanda.